The story opens with Brother and Sister Bear sitting at home, doing nothing, and bored. Sister Bear suggests some things they could do, but Brother dismisses her ideas. Annoyed, she accuses him of being in love with the soccer ball he’s been holding. Incensed, he challenges her to try to stop him from dribbling the ball past her. Of course, playing soccer in the house must end badly, and Mama’s favorite lamp is broken. When Mama arrives back home, moments later, Brother and Sister insist that it was a bird that broke the lamp–a purple bird with yellow feet, green wing tips, and red feathers sticking out of its head, they embellish. But Mama and Papa, who arrives later, aren’t fooled by their story. Mama tells them that the lamp can be fixed, but she is sad that her cubs, who she’s always trusted, are lying to her, and that trust can’t be so easily repaired. Like many of the later books, the story is just there to hang the moral lesson on, so it’s not that great. But the part with them describing the bird is a little amusing, and the lesson is good, even if it’s a bit unbelievable that they never lied again. The art is pretty good. It’s now in the style of the more recent books–this one was published in 1983–so it’s quite a bit smoother, though I do admit a fondness for the earlier art style. The part with the cubs describing the bird is again amusing–the illustrations make that scene. The moral lesson, as I said, is a good one. I like this better than most books that purport to teach children not to lie. In most such books, the moral seems to be something like “don’t lie, because you’ll get caught,” which is a rather… infantile… view of morality. This one proclaims “don’t lie, because you will be breaking someone’s trust in you, which is precious and hard to rebuild,” which is a much better lesson. There’s still a little “don’t get caught” in there, but it’s not what’s emphasized. 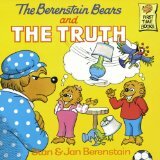 Ultimately, I’d say that The Berenstain Bears and the Truth is my favorite of the later (post-1970) Berenstain Bears books, or else a close second to The Berenstain Bears and Too Much Vacation. There are lots that I haven’t read, of course, but most of the ones I have read just lack the charm of the first few books. This one is again readily available in print or on the Kindle , and it’s worth a look. I may grow tired of repeating “this is available on the Kindle,” but so few children’s are that I think it bears repeating: publishers, take note–we can’t buy your books if you aren’t selling them to us.